The best way to learn about your calcium status is through a blood test. InsideTracker is a blood analysis service that measures key blood biomarkers, including calcium. If your calcium levels are too low or too high, InsideTracker gives you simple nutrition, exercise, supplement, and lifestyle interventions to improve them. Click here to learn how InsideTracker can recommend different calcium-rich foods to add to your diet! In bone mineralization, small amounts of calcium are removed from and replaced in the bones. 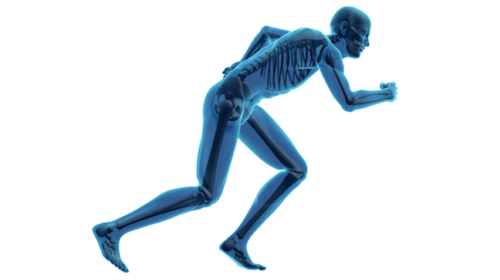 If your body doesn’t receive enough calcium through diet or supplementation, your bones become weaker. Having low calcium levels puts you at greater risk of breaks and fractures because more calcium is removed from your bones than is replaced, especially if you participate in such high-impact sports as running or gymnastics. When you’re chronically low in calcium, your bones and teeth begin to slowly deteriorate because your body is using its calcium stores to perform other functions, such as muscle contraction and forming new cell membranes. Poor blood clotting can also occur as a result. Osteoporosis, which literally means “porous bones,” is the condition that is most often associated with inadequate calcium. If you have osteoporosis, your bones have begun to weaken. Low calcium intake is a problem for post-menopausal women, who are already at a larger risk for developing bone-related disorders. In fact, an estimated 10 million Americans, which includes 8 million women and 2 million men, have osteoporosis. So, where can you get your recommended intake of calcium? When people hear “calcium,” they often think of dairy products like milk, yogurt, and cheese, which are rich sources of calcium. Low-fat dairy products have nearly the same amount of calcium as full-fat versions. There are also good non-dairy calcium-rich foods for anyone who is sensitive to lactose, or prefers to avoid dairy products. Dark leafy greens such as kale, broccoli, and Chinese cabbage are good sources. A three-ounce serving of canned salmon (with bones) provides nearly 20% of the daily requirement. And, if you’re looking for new calcium-rich foods to add to your diet, try kelp, quinoa, and okra. Your InsideTracker Nutrition and Food Basket pages offer lots of great suggestions for foods that will help you to improve your calcium levels. What factors can affect calcium absorption? Age – your body’s ability to absorb calcium decreases as you age, so older adults need to consume more each day. Caffeine intake – the stimulant in coffee and tea can moderately increase calcium excretion and reduce absorption. For instance, one cup of regular brewed coffee causes a loss of 2-3 mg of calcium. Alcohol intake – alcohol can reduce calcium absorption and inhibit certain liver enzymes that help convert vitamin D to its active form. However, the amount of alcohol that is needed to affect calcium status is unknown. If you feel you aren’t getting enough calcium from foods, you may want to consider taking a calcium supplement. Calcium supplements come in two forms: calcium citrate or calcium carbonate. Calcium carbonate is dependent on stomach acid for absorption, so this form is more readily absorbed while taken with food. Conversely, calcium citrate, which is less common in supplement form, is absorbed equally well with or without food. Another thing to keep in mind with calcium supplements is the amount of elemental calcium. You can find this information on the supplement facts label on the bottle, but in general, calcium carbonate is 40% calcium by weight, whereas citrate is 21% calcium. The percentage of calcium that is absorbed by the body depends on the total amount of elemental calcium consumed at one time—as the amount increases, the percentage of absorption decreases. Absorption is highest in doses that are less than or equal to 500 mg, so if you’re taking a 1,000 mg/day of calcium supplement, take 500 mg at two separate times during the day. Before starting to take a supplement, be sure to talk to your doctor. It’s important not to take too much calcium in supplement form. If you frequently take large amounts of calcium, you could be putting yourself at risk for hypercalcemia, which can result in decreased kidney function and calcification of red blood cells. Symptoms of hypercalcemia can include frequent urination, bone pain, fatigue, and constipation. So when it comes to calcium intake, more is not necessarily better. In fact, pre-menopausal women who take high amounts of calcium are at an increased risk for hip fractures. Since calcium plays such an important role in your health and physical performance, sign up for an InsideTracker plan today to find out what your calcium levels are and how to optimize them! Click here to view the free InsideTracker demo.